A-dec ICX Waterline Treatment Tablets ® Convenient single-dispensing packets eliminate measuring, mixing and messy solutions. Available for 0.7-liter and 2-liter bottles. Simple. Effective. Affordable. 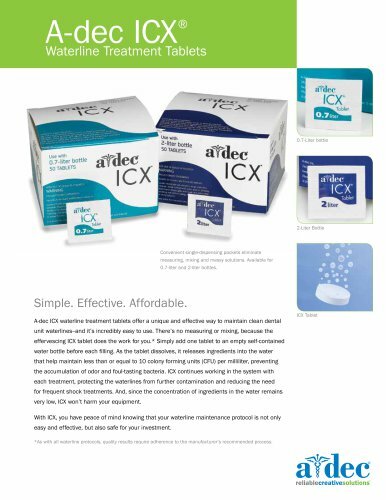 A-dec ICX waterline treatment tablets offer a unique and effective way to maintain clean dental unit waterlines--and it’s incredibly easy to use. There’s no measuring or mixing, because the effervescing ICX tablet does the work for you. * Simply add one tablet to an empty self-contained water bottle before each filling. As the tablet dissolves, it releases ingredients into the water that help maintain less than or equal to 10 colony forming units (CFU) per milliliter, preventing the accumulation of odor and foul-tasting bacteria. ICX continues working in the system with each treatment, protecting the waterlines from further contamination and reducing the need for frequent shock treatments. And, since the concentration of ingredients in the water remains very low, ICX won’t harm your equipment. With ICX, you have peace of mind knowing that your waterline maintenance protocol is not only easy and effective, but also safe for your investment. *As with all waterline protocols, quality results require adherence to the manufacturer’s recommended process.